India Today in just one of the many publications that is doing it's bit to cleanse the image of Arundhati Roy who is in news for her anti-National statements. This got even more highlighted when Actor Paresh Rawal tweeted against her. IndiaToday tries to explain a lot, citing many sources but does not talk about the source of the video where Arundhati says India is waging war against it's own states. The question is of intention. If you see who uploaded this video on youtube - a Patriotic Pakistani - you will get an idea about who is listening her. The credibility of the article touches it's lowest point when they quote AltNews.in as a media watchdog! Seriously? Should we laugh or get angry? Do they know the meaning of media watchdog? Certainly not. 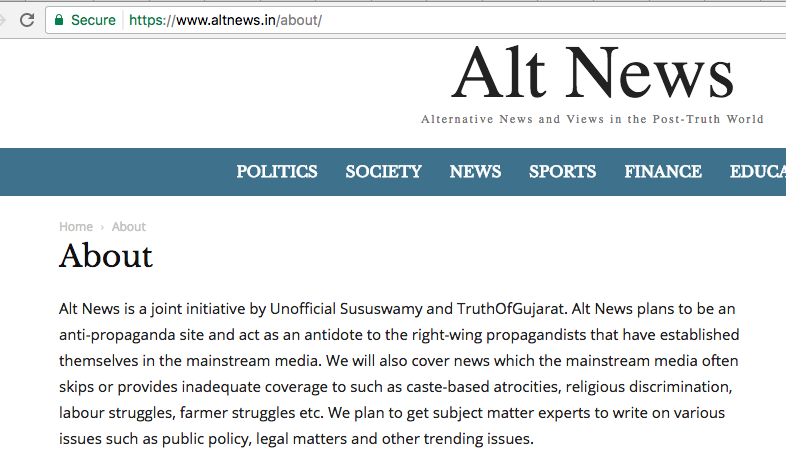 Look at what the About Page of the altnews.in says about themselves. This is as stupid as someone can get! It describes itself as antidote to the right-wing propagandists. Probably this is the definition of media watchdog that IndiaToday got from Rajdeep Sardesai. Requesting all the readers, whether liberal or right-wing or left-wing, if you really are Indians, then do something for the Nation and not against it! Don't just buy any propaganda. Apparently, India Today who's calling others fake doesn't care to do an introspection! #Don't stay silent when it comes to your Nation.